There are various factors that determined whether a particular photographic studio would be successful. Of course, even at the turn of the nineteenth century there existed "word of mouth," and certainly this would go a long way to ensure the success of a particular studio. However, as it is today, another important factor was the appeal of their product. When a potential client went about town, trying to decide which studio would create their family portrait, whose work would have the greatest appeal to them artistically? True, the question needed to be asked, "How many studios were there to choose from in any particular location a hundred years ago?" Not every town had a photographic studio. If they did, the studio might have been located in various strategic locations. They may have been situated in or about the town square, in a bazaar or by a cemetery (people often had their photo taken by the gravestone of a loved one.) A studio may also have been located in a room rented in a private house in a prime spot in the center of town, or it may have been be located near a governmental institution or police station, both of which would have found a nearby studio very useful. There were also photographic studios that were located on small streets outside of town that were perhaps less expensive than the ones located in the town center. Of course, cost was certainly a factor for many potential clients, but presentation did and still does matter. The ornate designs created by a number of lithographers then that adorned the backings of many a studio portrait attest to the fact that such designs were important. Not all photographic studios offered such ornate designs; some simply took the photograph and perhaps dispensed it to the client in a colored matte. 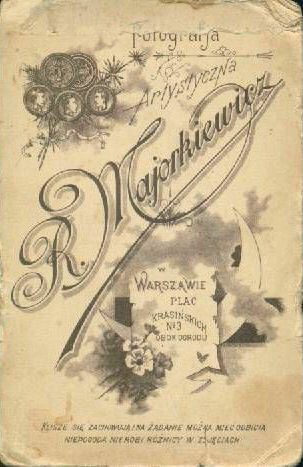 Lithography, though, was an art form for a period of time, and was advantageous for the studio and photographer alike.. The lithographic designs found on the backings of the early (pre-World War II) studio portrait generally can be found within two areas of the final product, namely on the side with the photo itself, at the bottom of the mount (i.e. the piece of cardboard onto which the photo was generally glued), and the back or "reverse" of the photo. 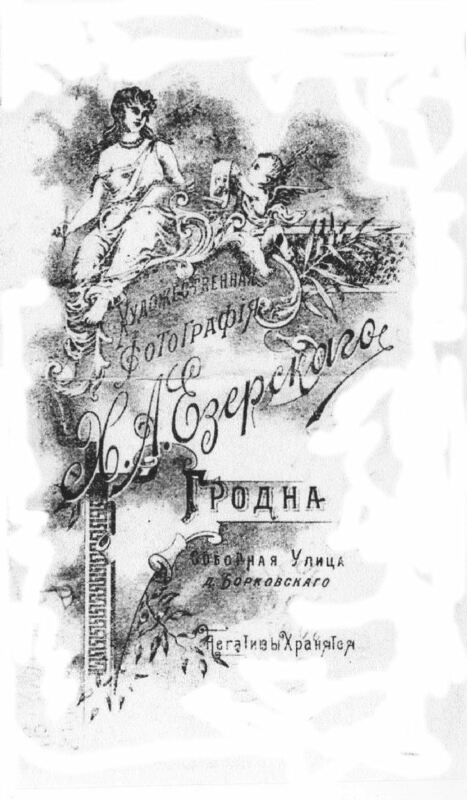 The studio imprint, located on the front side that contains the actual photograph, was generally located beneath the photo, and was most often presented in fancy script. 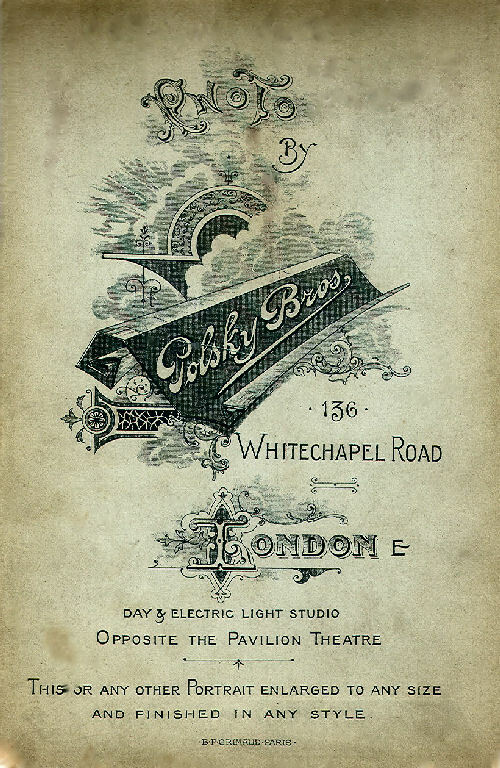 The name of the studio (quite often the name of the photographer himself) was displayed, and often times the town/city and country where the studio was located was also mentioned. The names of the studio or photographer were generally written in the language spoken the country in which the studio was located..
For most of the photographs shown in this exhibition, the writing on these photo backings are in Russian, using Cyrillic letters. 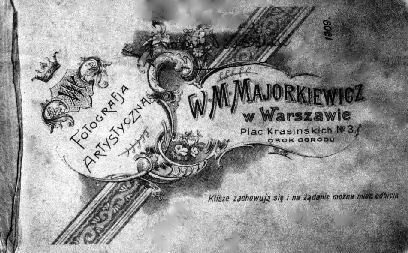 In some cases the name of the photographer would be written using Latin letters. Sometimes these imprints were non-descript, e.g. one might just see a design within which would be placed the words "Cabinet Portrait" or "Visit Portrait" at the bottom of the mount, with no mention of the studio or photographer. Perhaps the studio chose these words because of the importance and appeal of these types of portraits at the time. Perhaps the reason is that these mounts were more generic and were less expensive for the studio than those that had a particular studio name impressed upon it. 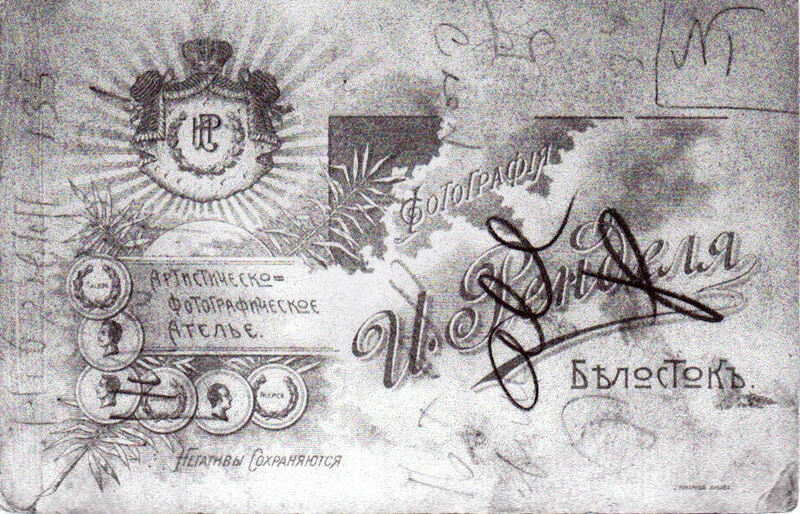 The reverse side of the photograph was the most impressive part of the lithography. Sometimes very simple in design, other times very ornate, these imprints gave the photographer an opportunity not only to impress his potential clients, but to advertise his product. On the photo backing there would often be a listing of awards or medals the photographer or studio might have received (or wished he or she had received), and also what services it offered. Generally, one can find the words "enlargements made" or "negatives saved" (just in case the client wished to order more prints in the future.) This was not possible when the "wet colloidal" process was used to create photographs, but when "dry plates" became available, this could now be accomplished. The studios kept an immense number of negatives on glass plates for many years. Sometimes the imprint would state that "enlargements could be made to any size" or "bad weather makes no difference," i.e. photography could be accomplished out-of-doors without much difficulty, however adverse the conditions. The lithographer often used images of flowers or artist easels and palettes to enhance their design. Within the imprint on the backing, there most often would be a display of medals embossed with the names of the "fathers of photography," i.e. 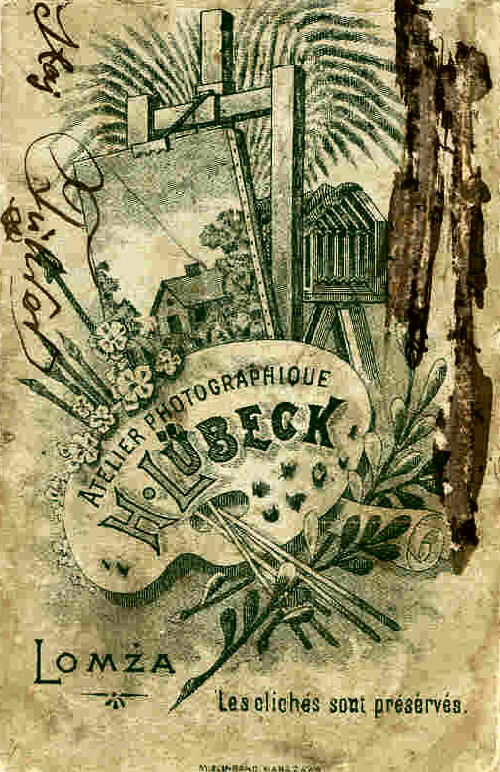 Daguerre, Niépce and Talbot. Sometimes there would be an illustration of one or more medals supposedly awarded to the studio or photographer by an international exposition such as the one held in Paris every eleven years. 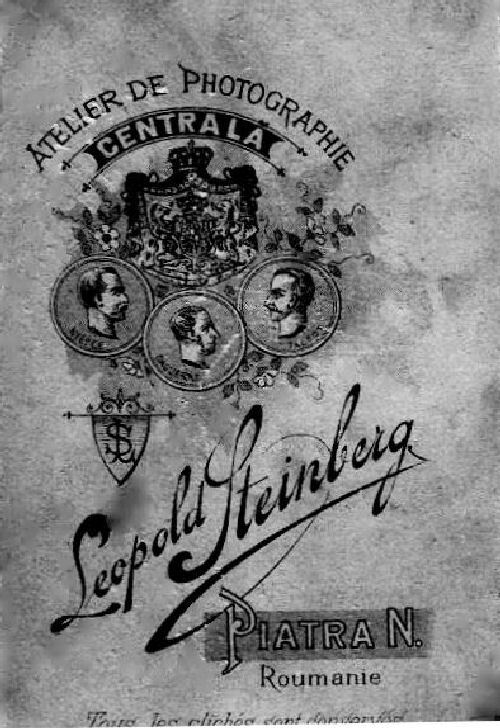 Below, at the very bottom on the right, the imprint suggests that Prof. Koller won a medal in 1878 at the Paris exposition (the Paris World's Fair or "la Exposition Universelle"). This may very well be the case. 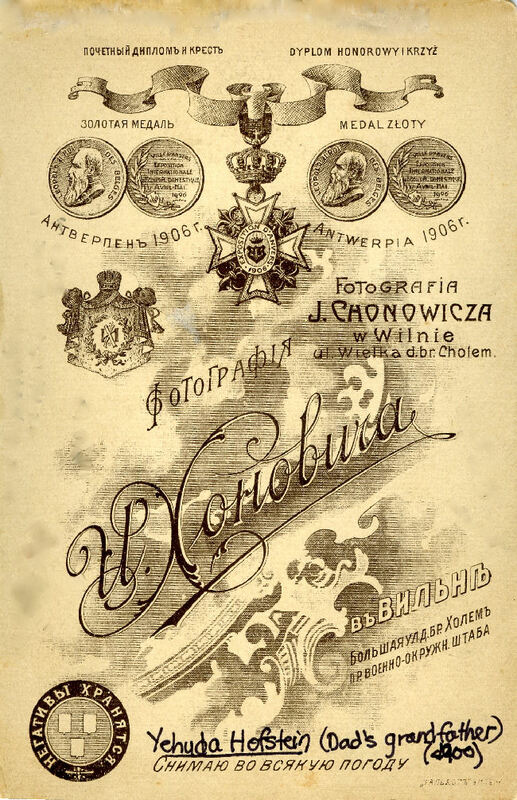 The backing of a studio portrait done by Chonovitz of Vilnius indicates that a gold medal was awarded to the studio at an International Exposition in Anvers (French for Antwerp) in 1906. 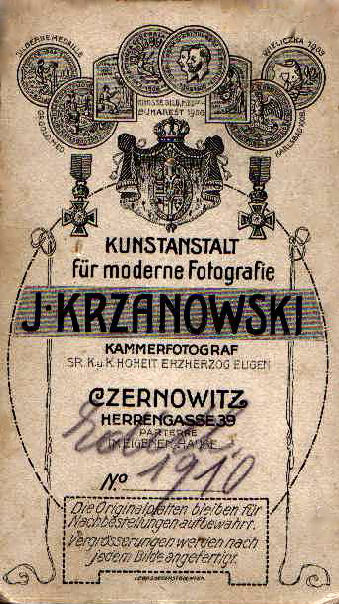 Sometimes, on the backings of photographs taken in the former Russian empire, it may be stated that the studio photographer was the "official" photographer of the Emperor, or a royal award was given to the photographer or studio for their excellent work. You can see such mentions listed in both Russian and English within the photos below. More information about the studio might also be included, such as the studio address and perhaps the names of other locations where they might have a "sister" studio. 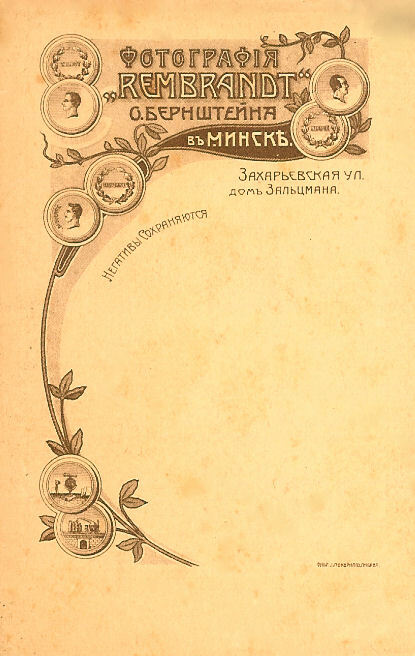 In the table below is a list of Russian words and phrases that might appear on the backing of one of your own family's studio photographs, along with their English translation. ►"Художественная фотографiя" means "artistic photographer's shop." ►"Ателье" means "atelier" or "studio." ►"Негативы сохраняются" and "Негативы хранятся" mean "negatives saved." ►"для увеличенiя портретовъ" means "for enlarging portraits." ► "Увеличение портретов до желаемого размера" means "enlargement of portraits to the desired size." ► "Плохая погода не препятствуетъ снимкам" means "poor weather makes no difference in making photographs." ► "Снимаю во всякую погоду" means "photographs in any weather." ► "Художественное увеличенiе портретов" means "artistic enlargement of portraits." ► "Специальное увеличенiе портретовъ до натуральной величины" means "special enlargement of portraits to the natural size." 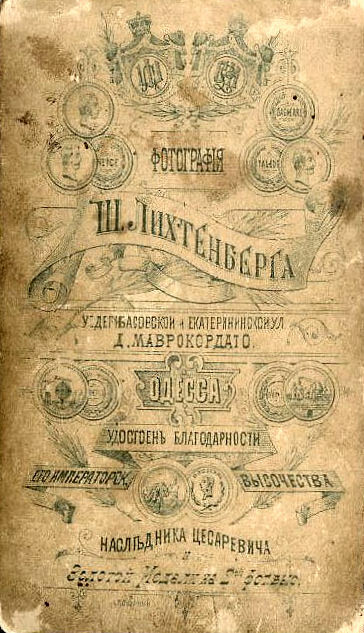 ► "Ателье для увеличенiя портретовъ" means "studio for enlargement of portraits." ► "Увеличенiе портретовъ до желаемого размера" means "enlargement of portraits to the desired size." ► "При фотографiи имеется специальное ателье для увеличенiя портретовъ" means "by the photographer’s shop there is a special studio for the enlargement of portraits." ►"Золотая медаль" means "gold medal." 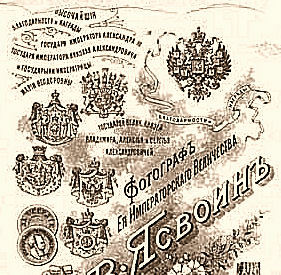 ►"Удостоены высших наград" means "received higher awards." 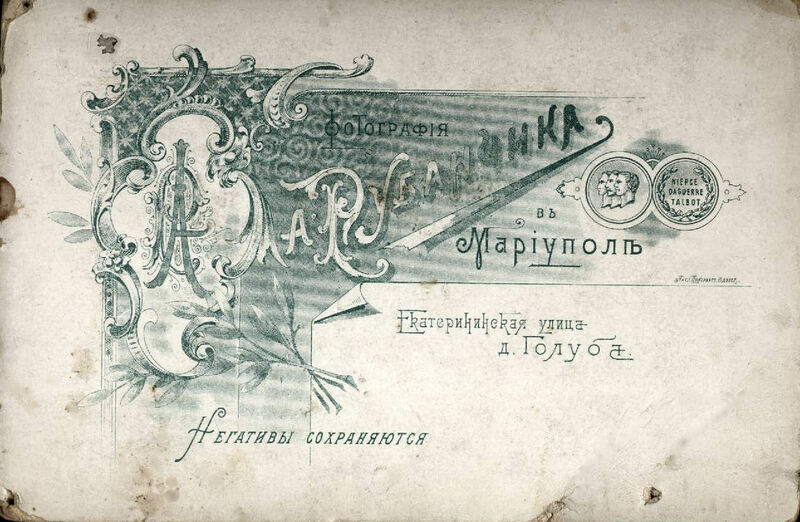 Some of the lithographers who supplied these photo mounts to the studios were: Iosif Iosifovich Pokorny (example of work on right, above) who had businesses in Odessa (see the Rubanchick backing on the right that was supplied by Mriansky.) 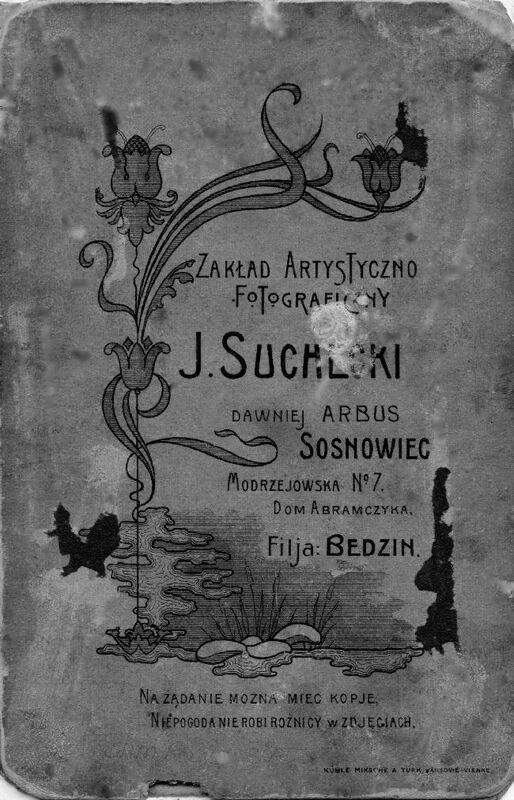 From 1891 to 1916, yearly photographic exhibitions were held, organized by an imperial technical society, and awards were handed out to photographers and perhaps to lithographers as well. At the time, Odessa, Ukraine, was considered to be the arbiter of fashion and quality. 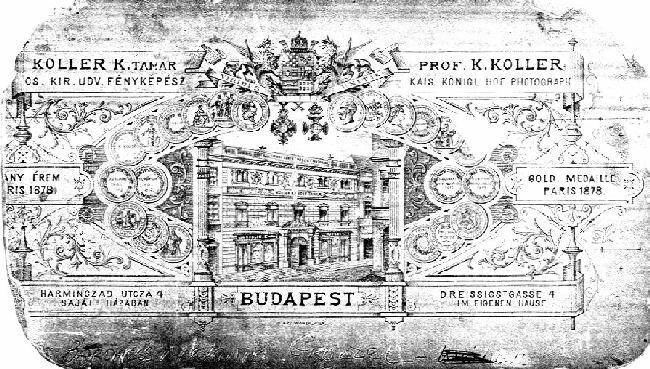 From the mid to late 1800s to the time World War II ended, these ornate lithographic designs were quite popular. Seemingly, after World War I, these photo mounts with such wonderful lithographic designs were not generally used and, for the most part, only stamps with the name of the studio and the town where the studio was located was found on the backing. One can only surmise why this occurred. 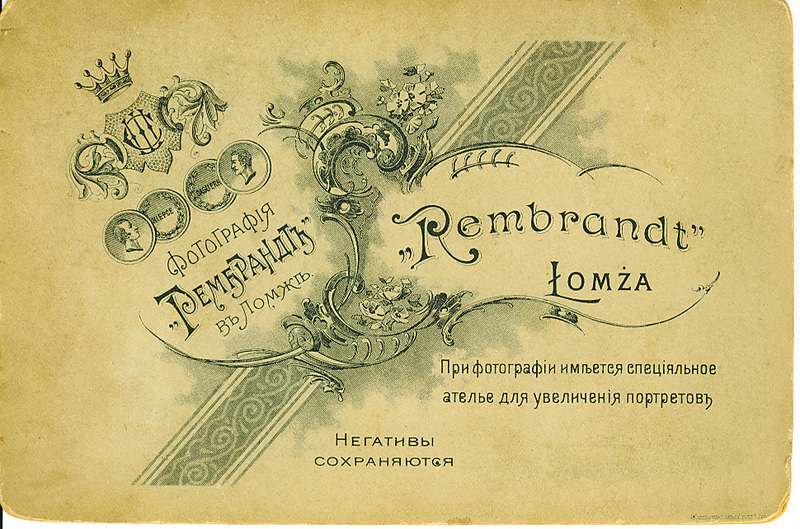 Perhaps the lithographers were no longer in business or the demand for these well-designed cards was no longer so in post-Revolution. 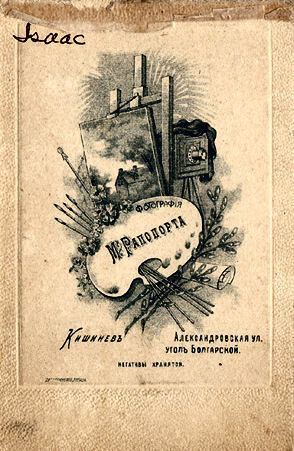 Perhaps the lithographer, photographer or studio could no longer afford to create or buy these new cards, or maybe such designs were considered to be bourgeoisie. 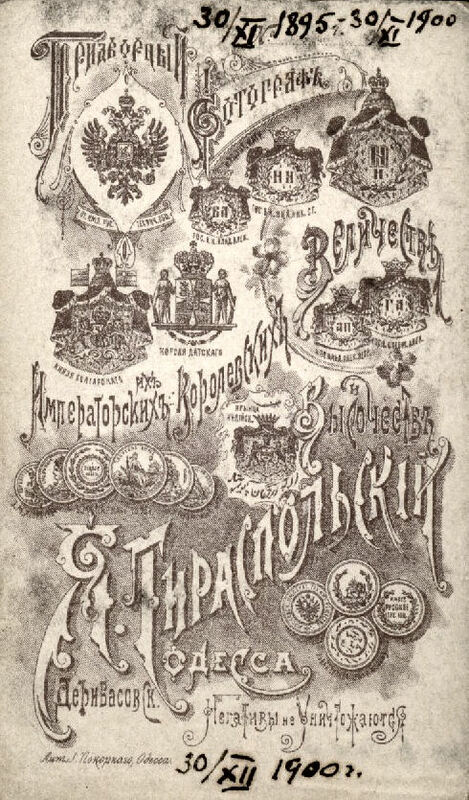 Of course, after the Russian Revolution, one would no longer find designs with medals given from a Russian emperor because there was no longer an emperor who ruled Russia. 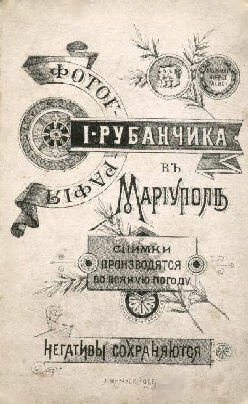 I. Rubanchik from Mariupol, Ukraine. 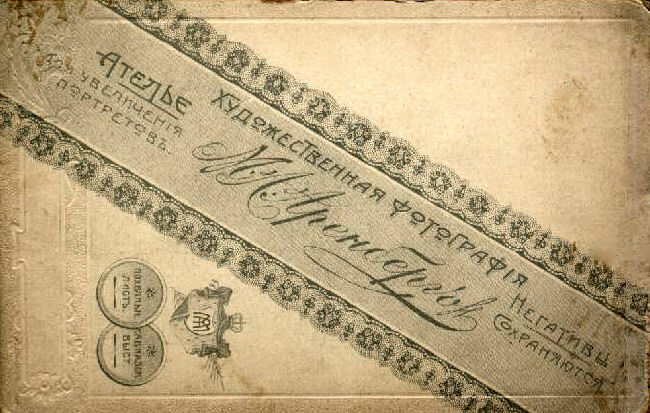 The backing of a photograph taken at the "Rembrandt" studio in Minsk, Belarus. As it is today, the name "Rembrandt" is synonymous with the very highest quality artwork, and many studios in several countries in Europe took this as the name as their studio. Some studios, just like the Rembrandt studios, had branches in different towns. 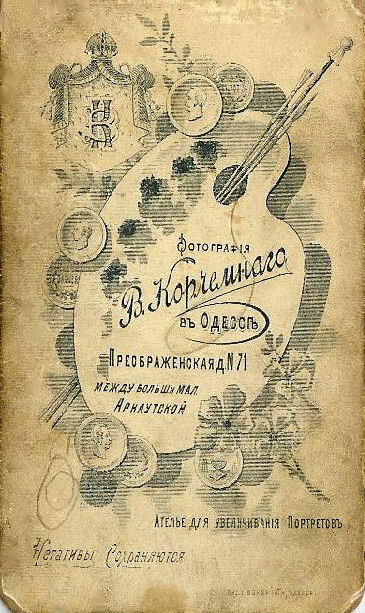 Reverse side of another Rubanchik photo from his studio in Mariupol, Ukraine. This time the supplier of the mount is I. Pokorny from Odessa. "If you want, you can have copies made. There is no difference from the originals. Bad weather makes no difference in photos." Ug. [corner] of Deribasovskaya and Ekaterininskaya ul. Heir Cesarevich [heir to the throne] "
"All the negatives are saved." 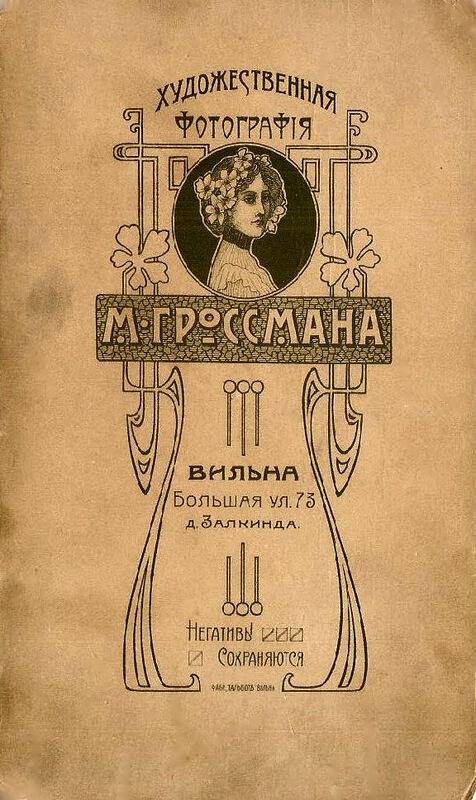 The inscriptions on Romanian studio portraits were often written in French. is a special studio for the enlargement of portraits. im eigenen (in own) house.